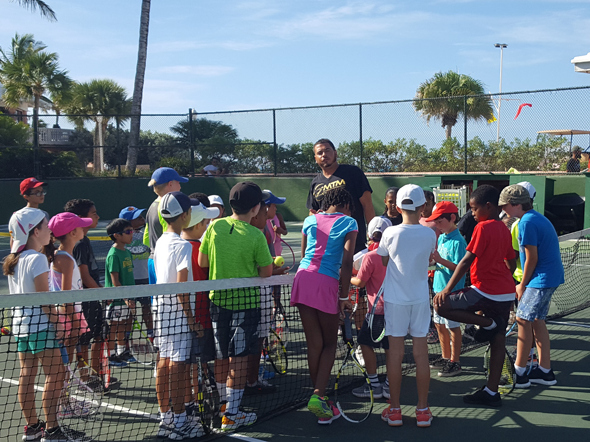 Manders Tennis Management (MTM) hosted a Red Ball Championships at the Fairmont Southampton Tennis Club recently with 40 children from all over the island there to partake in the activities. The tournament was all red ball, which is a slower ball, used on smaller courts to allow the children to be more successful, and have fun while learning the life lessons that tennis can teach. The goal of the event, was to give youngsters an opportunity to learn how to win and lose in a fun, and educational environment, while helping them learn the basics of scoring and match play. There was also a Under 6 Division, which gave the younger children the opportunity to be a part of the event, and start the process for their tennis development. They received points for making contact with the ball, and hitting it over the net, and points were tallied up for their overall score. A total of 12 children in the Under 6 Division, who had an absolute blast being apart it. MTM will continue to strive to do its part to grow the sport of tennis in Bermuda, and we will continue to use our passion for the sport, to help grow Bermuda’s next generation of tennis players. Some of the player’s understanding of the game at such a young age was quite impressive. There were quite a few children who just want to hit the ball really hard without actually understanding that there is an appropriate time and effective way to do it, but a lot of these kids clearly understood the importance of consistency and control which is a testament to the local coaches that are teaching them. The winners in the Under 10 Boys Divisions were Ethan Anderson, Tobiah Goodschild, Cyre Trott, and Xavier Da Ponte. The runner ups were Max Kimberley, Zacchaeus Grant, Dimitri Gantcharov, and David Sainsbury. The winner in the Under 10 Girls Division was Avani Patton and the runner up was Zipphorah Grant, while the winner in the Under 8 Divisions were Tristan Petit, and Kal-El Smith. The runner-ups were Jude Lefebrve, and Oliver Chow. The winner of the Under 8 Girls Division was Sienna Outtrim and the runner-up was Cora Desilva. The winner of the Under 6 was Ollie Anderson and the runner up was Ryan Walker.